O Allah, I ask You through the abundant grace of Bismillahi r-Rahmani r-Rahim… and I ask You through the majesty and the praise of Bismillahi r-Rahmani r-Rahim… and I ask You through the reverence of Bismillahi r-Rahmani r-Rahim… and I ask You through the sanctity of Bismillahi r-Rahmani r-Rahim. And through the power and the sovereignty and the greatness of Bismallahi r-Rahmani r-Rahim, and through the exaltedness and the strength and the potence of Bismillahi r-Rahmani r-Rahim – I ask You in the name of all these to raise me in Your estimation through the secret of Bismallahi r-Rahmani r-Rahim. Make light the matter that troubles me and comfort and console me when I am shattered and weak. O You who are Kaaf Haa Yaa ‘Ayn Saad; Haa Meem ‘Ayn Seen Qaaf; Alif Laa Meem; Alif Laa Meem Raa; Alif Laa Meem Saad. Grant me (all that I ask of You) through the secret of the Great Name (Ism ul-Lah il-‘Atham). Allah…there is no God but He; the One who is alive, the Eternal, the Sublime, the Great, the Possessor of Majesty and Honor. I ask You through the Majesty of Your Reverence and the Glory of Your Power; I ask You through the Immensity of Your Greatness and the Sovereignty of Your Power, to place me amongst those who have no fear and who do not grieve. I ask You through the Beauty of Your Splendor and the Radiance of Your Noble Face to cause me to enter – through Your Mercy – the blessed garden…O Lord of the entire created order. O Allah, I ask you through the great secret that resides in all that which have been mentioned before, to satisfy all my needs and my yearnings and to purify me from all the wrongs that I have committed. (Through that great secret) I also ask you to save me from all hurtful things and to raise me – in Your estimation – to the highest of all levels and to grant me the best of all that is excellent and blessed both in this life and the life after death. I ask You O Allah, to relieve me from the difficulties in which I find myself and to decree for me the best of that which I long for and intend to do; and to protect me from all sedition and sins and abomination. Protect me and my family and my children – and all those who are my responsibility – from all injury and evil and hardship… O Lord of the entire created order. – from Abdul Karim’s blog, Interpreter’s Path. Note: Wadi Hadhramawt is a 220-mile wadi (seasonal river valley) which has a collection of 31 small sultanates with Aden in the middle. Hadhramawt is the biggest wadi in the Arabian Peninsula and runs for 99 miles through a stony desert. This area has been settled since at least the 3rd century AD and brilliant green fields ran alongside the wadi. Contrary to what many people believe, The Prophet Muhammad (pbuh) is not the founder of Islam (Submission to God). He was a follower of Abraham, to whom God taught the religious duties that Muslims, those who submit to the One God, practice today (Qur’an 2:128). The Prophet’s (pbuh) role was to deliver the Qur’an to mankind, and purify the message and the practices of religion distorted by the idol worshippers. God revealed the Qur’an into Muhammad’s memory during Ramadan in the Night of Power (Qur’an 17:1, 44:3, 97:1-5). It was then gradually released from his memory in accordance with God’s will and written down by him with the help of Gabriel over a period of 23 years. InshAllah, God willing, the first day of Ramadan is July 20, 2012, and the last day of Ramadan is August 18, 2011 for most of USA and Canada. 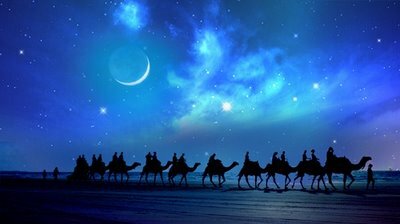 The first day of Ramadan is July 21, 2012, and the last day of Ramadan is August 19, 2012 for the Middle East, Turkey, Tunisia, Libya, Egypt, India, Pakistan, Indonesia, Australia and New Zealand etc. Laylat Al-Qadr, The Night of Destiny (or Night of Power) will be, inshAllah, on August 14, 2012 for those places that start fasting on July 20th, and August 15, 2011 for those countries that start Ramadan on July 21st. May Allah bless us all this Ramadan, accept our fasting and sincere repentance, and forgive our sins. Amin! Ramadan begins in a few days, so here, for the benefit of all who are observing Ramadan, are two excellent sources of inspiration on the Mysteries of Fasting during this blessed month. From Imam Al-Ghazzali – The Inward Conditions of Fasting. From Ibn Arabi – On the Secrets of Fasting. Ramadan in the year 2012/1433 begins Friday, July 20th, so here once again are the 30 Daily Ramadan Prayers (duas), which are reposted each year. InshAllah, they will enlighten the mind and ennoble the heart, making the fast easier in this blessed month. You are currently browsing the Darvish blog archives for July, 2012.